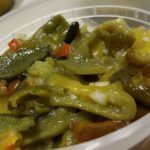 Roasted green pepper and onion antipasto: A pile of green bell peppers turned out to be quite the challenge for our kitchen. You can find no end of recipes for stuffing green pepper (and please, please, please! Regardless of what any stuffed pepper recipe says, blanch those peppers before stuffing them!!) but not so many for other dishes outside of a tasty salad. 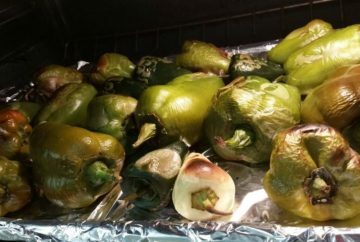 So, we were very excited to come across a very simple recipe for roasted peppers referred to in our post entitled “6 amazing green bell pepper recipes you need to know“. The heat slowly dries and lifts the fine outer skin from the flesh until after a further 15 minutes it peels away relatively easily. Leaving the peppers to cool will allow you to peel away that thin layer of skin more easily and this is where it can get a bit fiddly. Peel the peppers then cut them open to expose the inside. Using the back of a knife, scrape away and discard the seeds. Slice your peppers into finger-width lengths. Soak them in equal parts of olive oil and lemon juice. Sprinkle in some finely chopped fresh garlic and toss it all together. 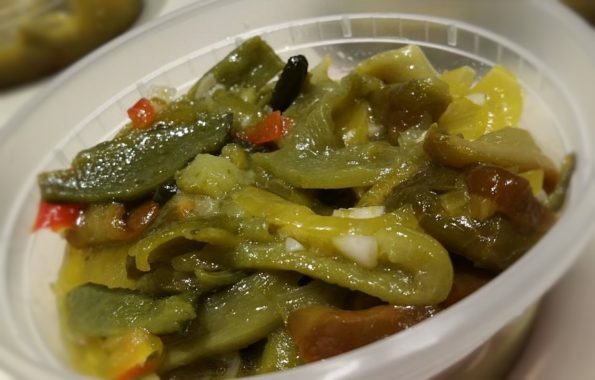 Since the roasted green peppers can be a little bitter, you may want to add a drop of honey or some sugar to the mix. 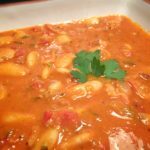 Add in small amounts and taste it as you go until you reach your desired flavour. 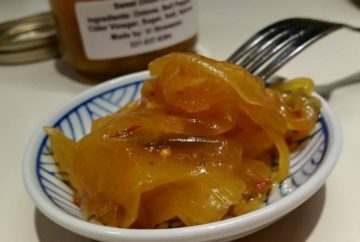 The idea to add a jar of Sweet Onion Jam by Vi came about because we didn’t want to sweeten the roasted green peppers too much. Vi’s Sweet Onion Jam added the perfect proportion of sweetness and texture that we needed and so it came to pass that our Green Pepper and Onion Antipasto was created! 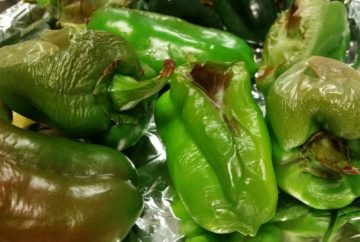 We will be bringing you some pots of Green Pepper and Onion Antipasto to The Farm on Saturday but be warned, it is a limited supply.